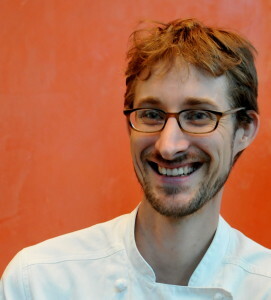 Trained at the venerable Dubrulle Culinary Institute in 2000 in Vancouver, British Columbia, Nick has since worked across Minneapolis and St. Paul in smaller passion-driven chef owned restaurants. Seven of those years spent at natural foods epicenter Café Brenda afforded him an advanced culinary toolset specializing in healthy whole foods, seafood, vegetarian and all around good scratch cooking. While fluent working with the palates of many world cuisines, he holds a special regard for the cuisines of the Mediterranean, particularly Italian. Serving 6 years as the collaborating chef for Mixed Precipitation‘s late summer Picnic Operetta brought together Nick’s love for garden spaces, live music and culinary expression. The Picnic Operetta production performs for and serves a 5 course story integrated tasting menu to an average audience of 150 for 15 shows each harvest season. Nick spent 3 years with Mill City Farmers Market as a market chef offering bi-weekly cooking demonstrations supported by the best farm fresh foods the area has to offer. While at cooking at Spoon River, Nick tested official recipes for the Spoon River Cookbook (2012). The area of healing with whole foods has been a longstanding interest of Nick’s leading him to take on further training as a Certified Healing Foods Specialist through Immunitrition, NY, NY, 2008. Nick’s chef career has co-evolved along side his impassioned involvement in the local urban agriculture and permaculture communities. He has worked as market gardener for St. Paul non-profit Farm in the City, taught a series of beginner gardening classes, served as a coordinator to various community gardens and has offered community wide vermiculture composting skill-shares. Knowing how to grow much of what he cooks gives him a special lens of experience in the kitchen.